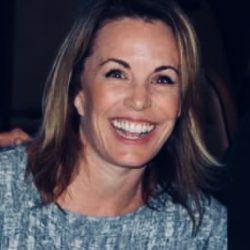 Amy Pew Cooper joined the World Business Academy in June 2018 as the chair of the Santa Barbara Retail Taskforce and to generate strategies and solutions in the efforts to revitalize downtown. She brings more than 20 years of experience working on political campaigns, public relations, brand management, and strategic communications, with companies such as Charles Schwab and Toad & Co.
Ms. Cooper is also the founder and owner of Plum Goods in downtown Santa Barbara – a six-time winner of “Best Gift Store” awarded by the Santa Barbara Independent. Established in 2010, Plum Goods recently doubled in size and now offers 4,000 square feet of ethically made gifts, jewelry, goods and original art along with sustainable clothing, shoes, and accessories. Amy’s philanthropic interests lie in sustainable business initiatives and renewable resources. She is a board member of Downtown Santa Barbara and is a passionate champion for the environment and Santa Barbara. When she’s not advocating for the enrichment of the community, you can find her practicing martial arts, enjoying the outdoors or dining at Arigato. She’s also really good at winning awards and was voted Business Champion of the Year in 2017.